From authentic food, refreshing margaritas, and unparalleled beer to incredible beaches. 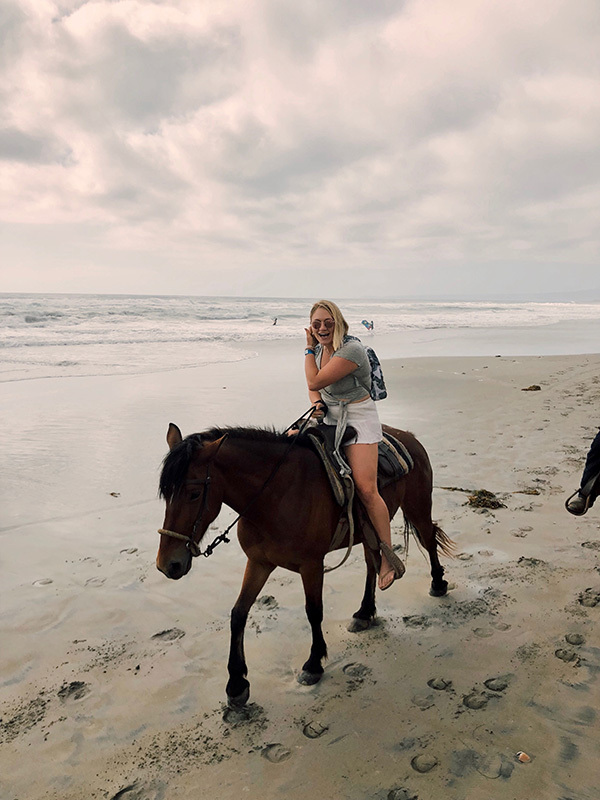 Storrey spent a three-day weekend in Rosarito. Exploring the local wine coutry. Mexico is a go-to vacation spot for a reason; from authentic food, refreshing margaritas, and unparalleled beer to incredible beaches and impeccable weather. 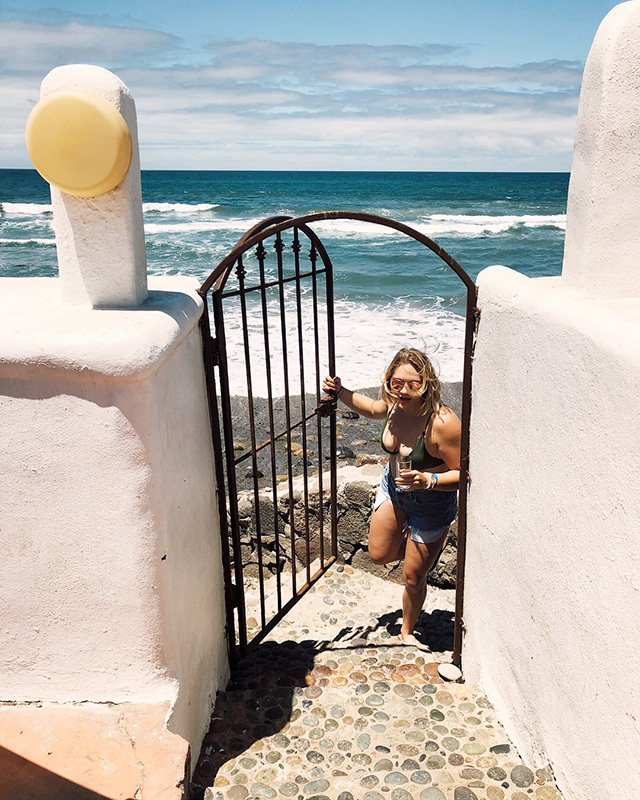 All over Mexico there are affordable vacation destinations and one can be found on the western coast just a two-hour drive from San Diego. Located 23 miles south of the California-Mexico border is a quaint beach town called Playas de Rosarito. The downtown area is a destination for many young adults due to the abundant bars and clubs. This town is a popular spot for spring breakers and jetsetters alike. The gate to the beach at our coastal AirBnb. We booked a nice AirBnb for a reasonable price in a secluded community just outside of town. The property had several different bungalows with different groups of guests, an aesthetically pleasing pool, a hot tub, and an unreal coastal view. 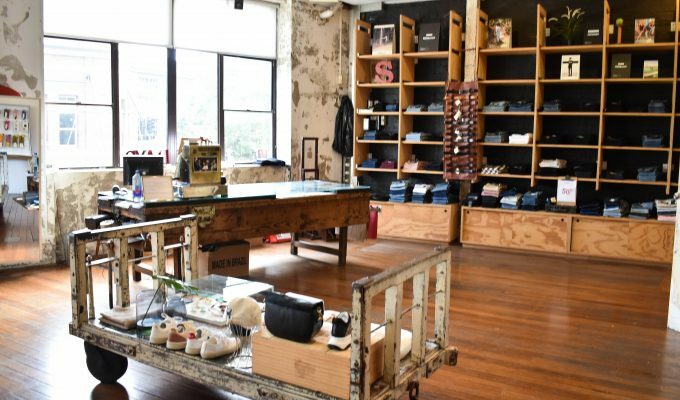 The space was minimal, clean, and comfortable. It was perfect for the two of us. My boyfriend and I drove down on Friday afternoon and spent the evening in the beachside hot tub. It was relaxing from the moment we arrived. The first night we got dinner at one of the local taco shops down the street. We got 6 authentic, enjoyable tacos for approximately $5. Enjoying the appetizer at Mina Penelope with a refreshing glass of their white wine. On Saturday we drove down to the local wine country, Valle de Guadalupe. We went to two wineries and two breweries. At the wineries we tasted interesting and unique wines that were local to the region. I am no wine connoisseur but each one was different and flavorful. 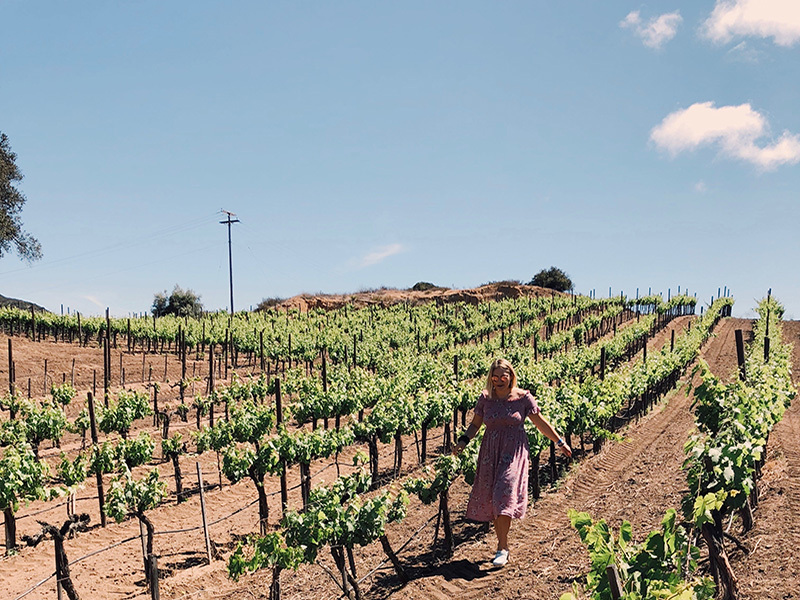 The landscape of Valle de Guadalupe was beautiful and exploring it truly felt like an adventure which is a feeling that I always look for while traveling. Our favorite restaurant and winery that we visited is called Mina Penelope. The menu was incredibly unique, modern, and surprising. Additionally, the staff was incredible welcoming and accommodating. The head chef, Roberto Alcocer, has the expertise of a Michelin star restaurant which was evident in the quality of the dishes we were served. Pictured is the appetizer of local green vegetables and herbs. We also had an impeccably roasted head of purple cauliflower with foamed goat cheese. Our meal concluded with an unreal molten caramel cake a la mode. The whole meal was paired with a refreshing white wine. 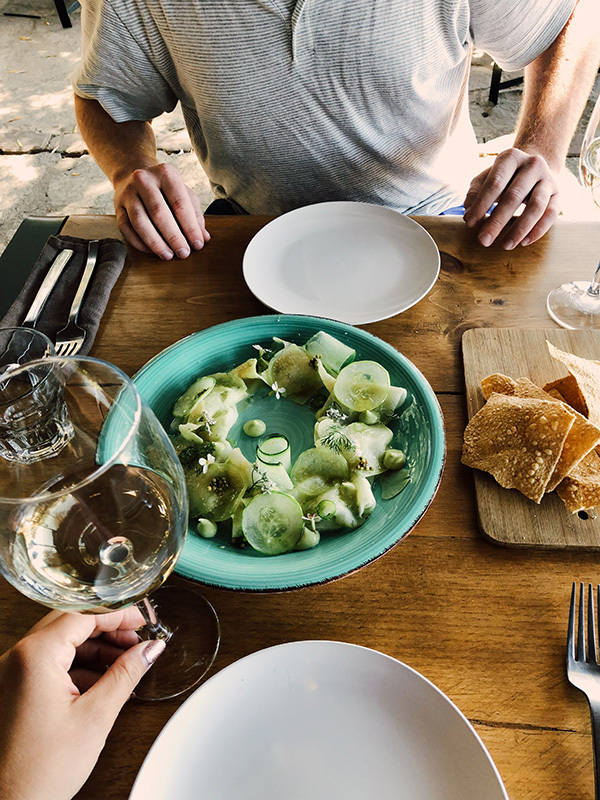 We paid Chef Alcocer our compliments and he gave us recommendations for restaurants, breweries, and wineries in the area. My experience at Mina Penelope was special because the staff made us feel valued and the menu left us in awe of the professional techniques and complex flavors that were presented in each plate. The outdoor seating area at Wendlandt. The two breweries we went to after Mina Penelope were Wendlant and Agua Mala. Wendlandt was fun to visit because you get to see the inner workings of the brewery while enjoying some of their different beers. The waterfront, outdoor seating area is a pleasant atmosphere for a Saturday afternoon of beer flights. Agua Mala had more of a bar-feel. In addition to a wide variety of refreshments they offer mouth-watering Mexican bar food, like black bean dip and ceviche. We loved Agua Mala so much that we bought matching sweatshirts. There are lots of breweries in the area and I definitely recommend visiting this part of Mexico to be able to experience the local culture. Riding horses on the beach. The last full day of our trip we spent drinking piña coladas and riding horses on the beach. Along the beach there are tons of small stands that sold comfort food like skewers of barbecued shrimp. We swam in the ocean and relaxed on the sand all day and at night we lounged in the hot tub drinking margaritas. 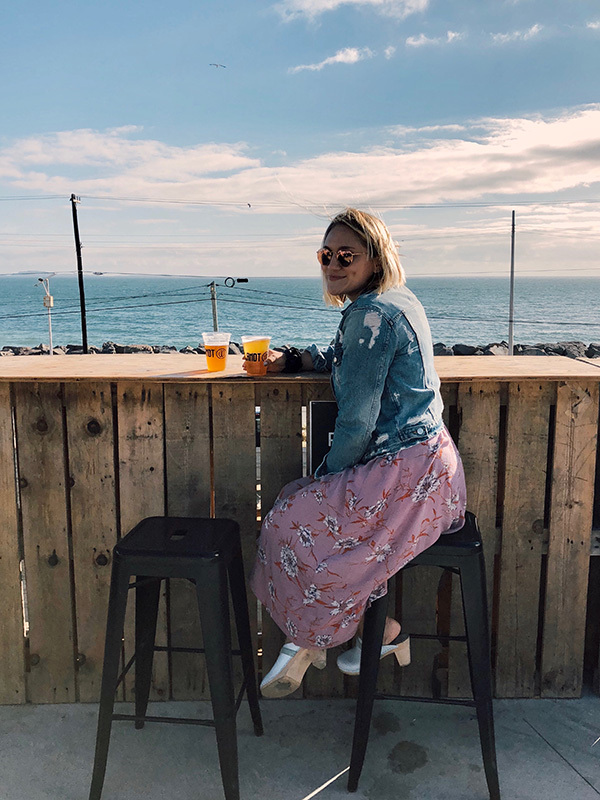 Our trip to Rosarito, Mexico was more than we could have expected, and I highly recommend visiting to anyone who needs the perfect weekend get-away. It was an incredible vacation at a reasonable price.